Lanvin is a high-end French fashion brand that designs and manufactures a variety of accessories and shoes for both men and women. With Big Apple Buddy’s personal shopping service, you can now buy direct from the USA Lanvin online store anytime, anywhere. The Small Jiji by Lanvin Bag in Smooth Calfskin is just one example of the elegant and stylish accessories that you can shop from at the USA Lanvin online store. 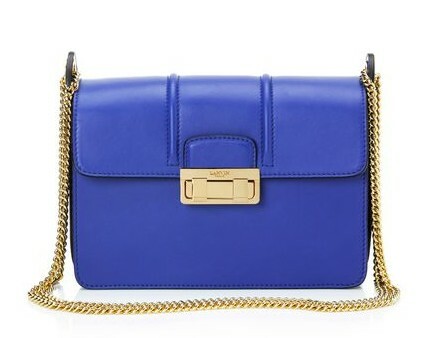 This bright blue bag will add a pop of color to any outfit and is the perfect size to bring with you for a night out. It will hang comfortably around your shoulder and has a lock engraved with the Lanvin signature to ensure that your belongings are safe and secure throughout the night. Even though the bag appears small, it has three different interior compartments to keep your essentials organized and easy to access at all times. Bring a little bit of color to your closet with this exciting accessory! Lanvin is also particularly well known for the impressive selection of shoes that they offer for both men and women. The Calfskin Pumps With Rivets, made of smooth soft black leather, have a pearl effect rivet details on the back of the ankle that add a little extra flair to an otherwise simple and timeless shoe. 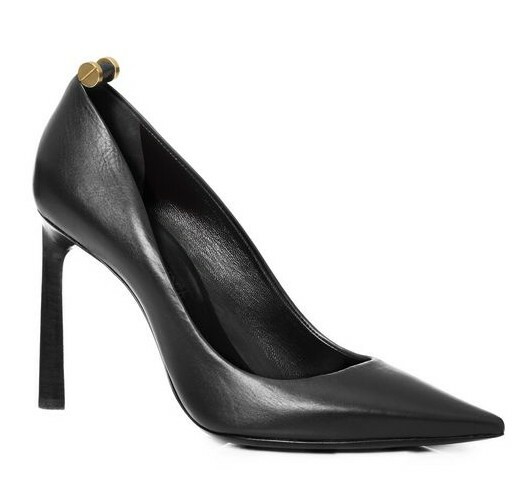 These black pumps are a classic addition to any woman’s wardrobe and can be easily paired with any outfit to make it a bit more formal for a special occasion. 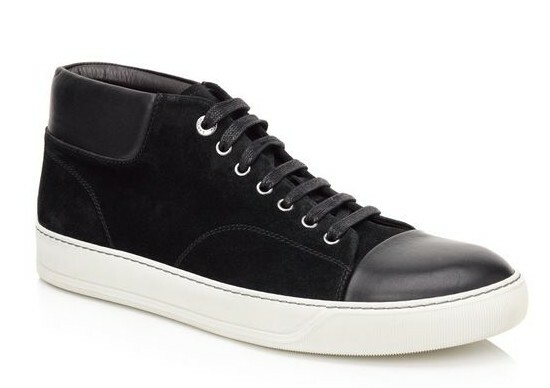 Men also have a variety of shoe and accessory options to shop from at the USA Lanvin online store. There are designs for both more casual and formal occasions, so you can be certain that you will find the right shoe for you! The Mid-High Sneakers in Velvet Calfskin and Nappa, which have calfskin lining and exclusive rubber soles, are a great accessory to make a casual outfit a bit more formal. The suede material make these shoes stand out from the rest of the ones in your closet, and they are comfortable enough to walk around all day in! Unfortunately, the USA Lanvin online store does not currently offer international shipping. However, Big Apple Buddy, your personal shopper, can help you buy products direct from the official USA Lanvin online store and ship them to your doorstep, no matter where you are in the world. We offer international shipping to over 110 countries including Australia, Austria, Azerbaijan, Bahrain, Belgium, British Virgin Islands, Brunei, Bulgaria, Canada, Chile, Costa Rica, Croatia, Czech Republic, Denmark, Estonia, Fiji, Finland, France, French Polynesia, Germany, Gibraltar, Greece, Greenland, Hong Kong, Hungary, Iceland, Indonesia, Ireland, Israel, Italy, Japan, Jordan, Kuwait, Latvia, Liechtenstein, Lithuania, Luxembourg, Macau, Malaysia, Maldives, Malta, Marshall Islands, Mauritius, Monaco, the Netherlands, Netherland Antilles, New Zealand, Norway, Oman, Poland, Qatar, Romania, San Marino, Saudi Arabia, Serbia and Montenegro, Seychelles, Singapore, Slovak Republic, Slovenia, Spain, South Africa, St. Lucia, Sweden, Switzerland, Taiwan, Thailand, the UAE, the UK, Vatican City, and Vietnam. If you would like to buy from the USA Lanvin online store, simply let us know which items you would like to order (by filling out the form below) and we’ll get back to you with a free international shipping quote within 24 hours!